This descriptive observational study was carried out in Guru Teg Bahadur Hospital to identify predictors and outcome of obstetric admission to Intensive Care Unit (ICU). Ninety consecutive pregnant patients or those up to 42 days of termination of pregnancy admitted to ICU from October 2010 to December 2011 were enrolled as study subjects with selection of a suitable comparison group. Qualitative statistics of both groups were compared using Pearson's Chi-square test and Fisher's exact test. Odds ratio was calculated for significant factors. 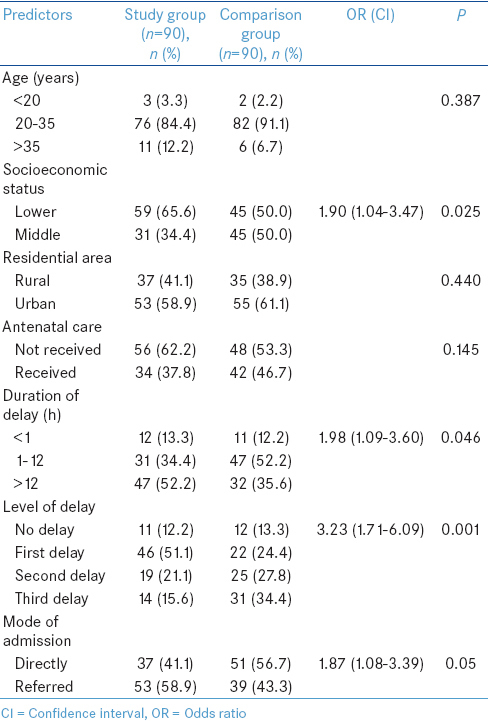 Low socioeconomic status, duration of complaints more than 12 h, delay at intermediary facility, and peripartum hysterectomy increased probability of admission to ICU. High incidence of obstetric admissions to ICU as compared to other countries stresses on need for separate obstetric ICU. Availability of high dependency unit can decrease preload to ICU by 5%. Patients with hemorrhagic disorders and those undergoing peripartum hysterectomy need more intensive care. Over 1 in 100 pregnant women suffer a life-threatening event and about 118 such events occur for each maternal death. Measurement of obstetric critical care is a real challenge. Evaluation of obstetric admissions to Intensive Care Unit (ICU) is one of the ways to approach surveillance of critically ill women in pregnancy in a tertiary care facility. , More studies are required on this patient group so as to create appropriate and better health-care facilities for each and every woman with complications related to childbearing. The objective of the present study was to determine predictors and outcome of obstetric admissions to ICU by assessing demographic characteristics, antecedent factors, delays, diagnosis, and interventions done in hospital and ICU. This descriptive observational study was conducted in the Department of Obstetrics and Gynecology and ICU of Department of Anesthesiology and Critical Care of University College of Medical Sciences and Guru Teg Bahadur Hospital (GTBH), New Delhi, India. ICU in this hospital has a provision of 12 beds for general patients including obstetric cases, which receives 800 patients annually. Obstetric ICU designed specifically for pregnant and postpartum women was not available. From a pilot study conducted 42% of non-ICU high-risk cases had cesarean delivery and with a wish to detect an odds ratio (OR) of 1.5  with 80% power and 95% confidence interval with 1:1 ratio, a sample size of 85 cases and 85 controls was adequate. Ninety pregnant women and those up to 42 days of termination of pregnancy who were admitted to ICU consecutively from October 2010 to November 2011 were enrolled as study subjects. To prevent bias in selection of cases, all consecutive admissions to ICU were analyzed. The patients of comparison group (selected from obstetric admissions to GTBH) were those women pregnant or up to 42 days of termination of pregnancy who did not require ICU admission but had same baseline condition for which study subjects were admitted to ICU. Patient in comparison group was enrolled in 1:1 ratio with the study subjects. Prior ethical approval was obtained from the Institutional Ethical Committee. An informed written consent was taken after enrollment from subjects and in unconscious patients consent was taken from close relative or attendant. A detailed history was taken regarding previous obstetric and medical history, antenatal care, treatment taken before admission to hospital, and any delays in reaching hospital. All information obtained was recorded in a predesigned case record form. Patients were followed till discharge or death. The study subjects were divided into three groups on the basis of outcome: Recovery, morbidity, and mortality. Those patients who recovered clinically and biochemically were classified in recovery group. Those who had residual clinical or biochemical abnormality at the time of discharge were classified in morbidity group. Patients who expired during hospital stay were included in mortality group. All three groups were also compared for demographic characteristics, clinical characteristics, treatment given before ICU admission, delay in reaching ICU, and treatment received in ICU. Clinical characteristics and indications such as hemorrhage, hypertensive disorders, obstetric injuries, and sepsis leading to admission to ICU were assessed as predictors of outcome in obstetric cases admitted to ICU. Microsoft Excel (version 2007) and statistical software SPSS for windows (version 17.0, IBM, Chicago, USA) were used for data presentation and statistical analysis. Qualitative parameters (age, socioeconomic status, residential area, antenatal care, duration of delay, levels of delay, and mode of admission) of cases and controls were compared using Pearson's Chi-square test and Fisher's exact test. Characteristics of subgroups of cases were also compared using Pearson's Chi-square test. P < 0.05 was considered statistically significant. During the study period, there were 22,547 admissions to GTBH and 15,775 deliveries were conducted. During this study period, total 90 obstetric cases were admitted to ICU. Thus, 0.4% of total obstetric admissions to GTBH were admitted to ICU. Total admissions to ICU (obstetric and nonobstetric) during the study period were 949 and obstetric cases formed 9.4% of total ICU admissions. Out of these 90 admissions, 45 (50%) recovered, 15 (16.7%) recovered with morbidity, and 30 (33.3%) had mortality. Out of 90 controls enrolled 80 (88.9%) had recovery, 10 (11.1%) patients had morbidity at the time of discharge, and no mortality was observed. [Table 1] depicts that subjects belonging to lower socioeconomic class were at almost 2-fold increased risk of admission to ICU as compared to those belonging to middle class (OR = 1.903). Duration of complaints of more than 12 h before reaching tertiary care facility and delay at an intermediary facility doubled the risk. Peripartum hysterectomy was single most significant intervention increasing probability of admission to ICU by 5 times. Sixteen peripartum hysterectomies were carried out in study subjects, 12 done for atonic postpartum hemorrhage, and 4 done for rupture uterus, where those were 3 and 1, respectively, in controls. As depicted in [Table 2], hypertensive disorders were found to be the most frequent clinical diagnosis leading to ICU admission (37.7%) followed by hemorrhage (28.8%), but worse prognosis was seen with hemorrhagic disorders with mortality to morbidity ratio of 1:2.8 as compared to 1:6.2 in hypertensive disorders. Among labor complications, two patients had intrapartum rupture of uterus and died due to excessive hemorrhage and consumptive coagulopathy. Another patient presented with prolonged and obstructed labor associated with chorioamnionitis and died due to sepsis and septicemic multiorgan failure. Among the nonobstetric illness, cardiac disease (4.4%) was the most common followed by epilepsy (3.3%) and severe anemia (2.2%). Out of 45 women, 43 in recovery group underwent surgical intervention, whereas 17 out of 30 women (70.0%) required surgical intervention in mortality group. It was found that early surgical intervention before admission to ICU improved odds of survival by 21 times. A significant correlation was found between the number of failed organs and mortality, with mortality varying from 0% in women with no organ failure to 96.7% in those with failure of three or more organs. Five patients had only one organ system involvement and did not require mechanical ventilation. These patients could have been managed in a high dependency unit (HDU) had this been available. Among interventions done in ICU, mechanical ventilation was the most common intervention and one-third of women requiring mechanical ventilation died. Women requiring vasoactive support were at 13 times higher risk of mortality [Table 3]. In contrast to study conducted by Zeeman  and the belief that women who receive antenatal care are less likely to enter ICU for critical care, antenatal care was not found to reduce the risk of ICU admission in the present study. This may reflect on the quality of antenatal care in our country. Very few women could present to health facility without any delay. Study conducted by Bajwa et al. in Banur, India, also found poor transport facilities, poor rural health infrastructure, customs, and traditions of local community to be contributing toward increased ICU admission. Similar to previously reported studies, immediate nonavailability of ICU at the time when decision to transfer patient to ICU is made is associated with thrice increased probability of death. This observation stresses on need to have more dedicated obstetric beds in general ICU or have a separate obstetric ICU. It was observed that women who underwent peripartum hysterectomy were at 5-fold increased risk of admission to ICU. This observation is coherent with the recently proposed WHO criteria for defining near miss cases where hysterectomy has been defined as a way of quantifying near miss cases. Furthermore, a study done in tertiary care hospital of Karachi has reported 10-fold increased risk of a woman becoming near miss if they had undergone hysterectomy. Although this factor may not be amenable to change but may be useful in identification of women who require extra vigilance. Involvement of more than one organ systems was seen in 86% women out of whom 38% expired. This is very high in comparison to previous studies where more than one organ system was involved in around 20% cases. This reflects on to the poor health status of our women and the advanced stage of disease by the time they reach ICU. The study is one of the very few Indian studies analyzing severe maternal morbidity with ICU admission as criteria. However, it is not possible to generalize results of the study for all settings. ICU admission as a measure of SAMM can lead to underestimation of incidence as it is restricted by access and availability of ICU. Hence, further studies with larger sample size are recommended. Waterstone M, Bewley S, Wolfe C. Incidence and predictors of severe obstetric morbidity: Case-control study. BMJ 2001;322:1089-93. Richa F, Karim N, Yazbeck P. Obstetric admissions to the intensive care unit: An eight-year review. J Med Liban 2008;56:215-9. Demirkiran O, Dikmen Y, Utku T, Urkmez S. Critically ill obstetric patients in the intensive care unit. Int J Obstet Anesth 2003;12:266-70. Zwart JJ, Dupuis JR, Richters A, Ory F, van Roosmalen J. Obstetric intensive care unit admission: A 2-year nationwide population-based cohort study. Intensive Care Med 2010;36:256-63. Almerie Y, Almerie M, Matar H, Shahrour Y, Chamat A, Abdulsalam A. Obstetric near miss and maternal mortality in maternity university hospital, Damascus, Syria: A retrospective study. BMC Pregnancy Childbirth 2010;10:65. Goffman D, Madden RC, Harrison EA, Merkatz IR, Chazotte C. Predictors of maternal mortality and near-miss maternal morbidity. J Perinatol 2007;27:597-601. Okafor UV, Efetie ER. Critical care obstetrics in a developing country. J Turk Ger Gynecol Assoc 2008;9:9-13. Leung NY, Lau AC, Chan KK, Yan WW. Clinical characteristics and outcomes of obstetric patients admitted to the Intensive Care Unit: A 10-year retrospective review. Hong Kong Med J 2010;16:18-25. Tempe A, Wadhwa L, Gupta S, Bansal S, Satyanarayana L. Prediction of mortality and morbidity by simplified acute physiology score II in obstetric intensive care unit admissions. Indian J Med Sci 2007;61:179-85. Gupta S, Naithani U, Doshi V, Bhargava V, Vijay BS. Obstetric critical care: A prospective analysis of clinical characteristics, predictability and fetomaternal outcome in a new dedicated obstetric intensive care unit. Indian J Anaesth 2011;55:146-53. Zeeman GG. Obstetric critical care: A blueprint for improved outcomes. Crit Care Med 2006;34 9 Suppl: S208-14. Bajwa SK, Bajwa SJ, Kaur J, Singh K, Kaur J. Is intensive care the only answer for high risk pregnancies in developing nations? J Emerg Trauma Shock 2010;3:331-6. Karnad DR, Lapsia V, Krishnan A, Salvi VS. Prognostic factors in obstetric patients admitted to an Indian intensive care unit. Crit Care Med 2004;32:1294-9. Cecatti JG, Souza JP, Oliveira Neto AF, Parpinelli MA, Sousa MH, Say L, et al. Pre-validation of the WHO organ dysfunction based criteria for identification of maternal near miss. Reprod Health 2011;8:22. Hasan IJ, Nisar N. Womens′ perceptions regarding obstetric complications and care in a poor fishing community in Karachi. J Pak Med Assoc 2002;52:148-52. Pappachan VJ, Smith GB. Multicenter study of obstetric admissions to 14 intensive care units in southern England. Crit Care Med 2001;29:770-5. Pérez A, Acevedo O, Tamayo Fdel C, Oviedo R. Characterization of obstetric patients with multiple organ failure in the intensive care unit of a Havana teaching hospital, 1998 to 2006. MEDICC Rev 2010;12:27-32. Oliveira-Neto A, Parpinelli MA, Cecatti JG, Souza JP, Sousa MH. Sequential organ failure assessment score for evaluating organ failure and outcome of severe maternal morbidity in obstetric intensive care. ScientificWorldJournal 2012;2012:172145.